A Strategic Lawsuit Against Public Participation (or “SLAPP”) is a lawsuit brought to prevent or punish someone for exercising their First Amendment right to speak about public issues or to petition the government. In response to this abuse of the court system, California enacted Code of Civil Procedure Section 425.16, known as the “anti-SLAPP” statute. It allows a defendant against whom a SLAPP is brought to file a special motion to strike and, if granted, have the case dismissed and also recover his attorney’s fees. In recent years we have seen situations where the anti-SLAPP statute has been triggered in homeowners association (“HOA”) disputes (i.e., statements made in connection with HOA Board elections). The 2017 case of Colyear v. Rolling Hills Community Association of Rancho Palos Verdes (9 Cal.App.5th 119) (Rolling Hills) is another example. In Rolling Hills, the defendant homeowner, Liu, submitted an application to his HOA to invoke the HOA’s dispute resolution process against his neighbor, Colyear. 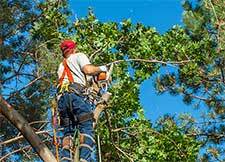 Colyear refused to trim trees blocking Liu’s view, despite the fact that there was a protective covenant within the HOA’s governing documents designed to preserve views. In response, Colyear sued Liu and the HOA, alleging, among other things, that the covenant did not encumber Colyear’s property and that Liu and the HOA were wrongfully clouding title to Colyear’s property. Liu then withdrew his application and filed a special motion to strike Colyear’s claims under the anti-SLAPP statute. The trial court granted Liu’s motion.